Kamakura is a wonderful coastal town roughly an hours drive to the south of Tokyo, famous for many sights, including the giant statue of Buddha, dating back to the mid-thirteenth century. The stature stands in the open, a stream of halls having been destroyed in storms over a period of two hundred years with the final one being taken by a tsunami in 1489. At this point the locals took the hint and left Buddha uncovered to smile at the stars. Ringed by hills and only accessible by sea, from 1185 to 1333 it was also the capital of the fledgeling country until the destruction of the existing shogunate and a return to Kyoto rule. These days Kamakura is a popular tourist destination and equally popular with the windsurfers. 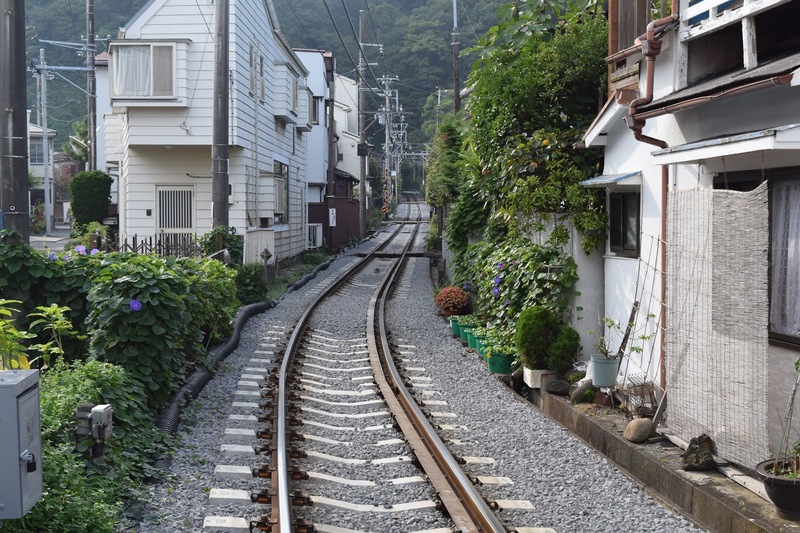 But it is also home to the tightest electric railway in Japan. Slotted between the houses and back streets, the Enoshima Electric Railway opened in 1902, joining Kamakura with the town of Fujisawa, some fourteen stations further down the coast. The line, including some of the tightest turns or track in Japan, is a must for any train enthusiast but also has a completely separate influence on the town. When constructed, the railway cut directly through the residential centre, isolating many homes and the odd restaurant from their access roads. So if you want dinner, you're going to have to walk across the tracks. Not sure I'd really want to try that after a couple of glasses of sake it has to be said. However, good to know that 'Health & Safety' demurs to charm in Japan.